Americans spent a record-setting $13.5 billion on cosmetic procedures in 2015. While men only made up a small percentage (approximately 10%) of the patients that underwent cosmetic procedures in 2015, the number of men choosing to have “work” done has been steadily rising since the late ’90s. According to the 2015 statistical data published by the American Society for Aesthetic Plastic Surgery, the total number of male cosmetic procedures has tripled since 1997. It’s not surprising to see a shift in men’s attitudes towards cosmetic procedures over the last decade. With more and more emphasis put on the importance of youth and beauty in American culture, men are beginning to take advantage of the benefits that cosmetic procedures have to offer. Many psychology and economy studies have been done and have reported that attractive people are more successful in the workplace: they get hired faster, make more money, and get promoted more quickly. So in addition to wanting to look attractive and feel confident, men are using cosmetic procedures as a way to stay competitive in the job market. Cosmetic procedures are an excellent way to boost your self-confidence and invest in yourself. An expertly crafted facelift is subtle and completely natural looking; making you look like you did 10-15 years ago. Eyelid surgeries are also one of the top 5 most popular procedures for men because they improve the appearance of drooping, heavy eyes that appear old and tired. Technological advancements are also making cosmetic procedures more attractive to men. Due to cosmetic surgery’s past stigma, men are less likely than women to want to share that they have had cosmetic work done. In the past, that ruled out surgery options that came with tell-tale signs: visible scars, over-tightened skin, or unnatural results. However, with all the advancements in surgical techniques and technology, there are plenty of choices for men that want to regain their youthfulness and enhance or refine features without anyone knowing. Plus, now there are many non-invasive and minimally-invasive procedures and injectable treatments for younger men that may not be ready for surgery. 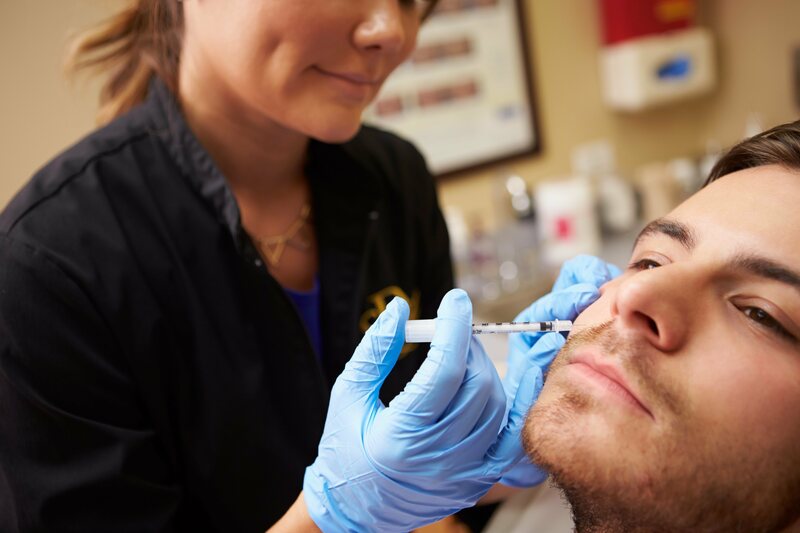 Last year alone, men had over 1 million non-surgical procedures including chemical peels, skin resurfacing, skin tightening, fat reduction, laser hair removal, and injectables. Advancements in technology are also allowing for precise sculpting and defining that wasn’t previously possible. Liposuction isn’t just about mass fat removal anymore; it is now used to sculpt fat, allowing the underlying muscles to appear more distinctly. For many men, putting in all the time at the gym and a strict diet still doesn’t get rid of stubborn fat deposits. VASER liposuction is a minimally invasive procedure that gets rid of stubborn fat and leaves smooth, defined musculature. If you are ready to find out more about all of the ways Dr. Shapiro and his Skin Klinic can help you regain your confidence and feel great about the way you look, call (480) 451-1700 to set up a consultation today!